[SLIDES] Big Data from an Earth Scientist’s perspective, Computer Science Dept, University of Louisiana at Lafayette. [SLIDES] Big Data from an Earth Scientist's perspective, EARTH 1B: Know Your Planet: Big Earth, Stanford. [SLIDES] AIS Applications on Research Vessels, RVTEC, Miami, FL. [SLIDES] Data at All Scales with the Google Cloud, AIS Summit, Hamburg, Germany, 2015. [WWW] Whale Alert: A Tool for Reducing Collisions Between Ships and Endangered Whales, AAAS Annual Meeting, 2015. [SLIDES] K. Schwehr, Keynote to the Scripps Student Symposium, Scripps Student Symposium, La Jolla, CA, Sept, 2015. David Wiley, Roland Arsenault, Moira Brown, Michael Carver, Patrick Ramage, Kurt Schwehr, Michael Thompson, Brad Winney, Jaime Jahncke, Whale Alert: Updates and enhancements to a tool for reducing collisions between ships and endangered whales, Society for Marine Mammalogy, San Francisco, CA, Dec, 2015. [VIDEO][SLIDES][github] Brendan Kenny, Paul Saxman, Kurt Schwehr, Google Ocean (and Tons of Ships), Ocean Agenda, Google, Mountain View, CA., April, 2014. [PDF] CCOM/JHC, 2013 UNH/NOAA Joint Hydrographic Center, Performance and Progress Report, University of New Hampshire, Apr 2014. [PDF Abstract][Abstract] David Wiley; Roland Arsenault; Christopher W. Clark; Tim Cole, Peter DeCola, Deborah Hadden, Beth Josephson, Christin Khan, Jake Levenson, Patrick Ramage, Kurt Schwehr, Michael Thompson, Brad Wellock, Brad Winney, WhaleAlert: A mobile app for transmitting right whale conservation and management information to the maritime industry, Society of Marine Mammology Conference, Dec, 2013. [SLIDES] David Wiley, Roland Arsenault, Moira Brown, Christin Khan, Patrick Ramage, Kurt Schwehr, Michael Thompson, Brad Winney, April Wobst, WhaleAlert: Improvements and updates to a mobile app for transmitting right whale conservation and management information to the maritime industry, NARWC North Atlantic Right Whale Consortium Meeting, Nov, 2013. [YouTube] Francesc Campoy Flores and Kurt Schwehr, Mapping Big Data with Google's Cloud Platform, Google Developers Live, Nov, 2013. [PDF][PDF USCG] David Wiley, Leila Hatch, Lindy Johnson, Kurt Schwehr, Michael Thompson, Craig MacDonald, Marine Spatial Planning to Protect Endangered Whales - Realigning the Boston Traffic Separation Scheme and other MSP actions to reduce the risk of collisions between ships and North Atlantic right whales, US Coast Guard Proceedings, 2013. [VIDEO][PDF][WWW] Francesc Campoy Flores, Mano Marks, Kurt Schwehr, All the Ships in the World: Visualizing Data with Google Cloud and Maps, Google I/O, May, 2013. [VIDEO][WWW] Brendan Kenny, Google Maps + HTML5 + Spatial Data Visualization: A Love Story, Google I/O, May, 2013. Unnamed contributor. [PDF] K. Schwehr, Google Oceans - 1 hour tutorial, Oceans - Challenges and Opportunities, Porto, Portugal, May 13, 2013. [PDF] K. Schwehr, Google Oceans - short overview, Oceans - Challenges and Opportunities, Porto, Portugal, May 16, 2013. [SLIDES][PDF][GoogleDoc][WWW] K. Schwehr, J. Adams, J. Austin Foulkes, Classification of Bathymetry Grids using Open Source Tools, AAG Annual Meeting, April 09, 2013. [WWW] Mano Marks and Brendan Kenny, Mapping Hidden Stories, Strata 2013 Conference, 27 Feb 2013. Unnamed contributor. [PDF] CCOM/JHC, 2012 UNH/NOAA Joint Hydrographic Center, Performance and Progress Report, University of New Hampshire, Apr 2013. [TXT] Beyer, Mehnert, Sandwell, Kolb, Foulkes, Schwehr, Johnson, Display of Magellan SAR and Topography Data in Google Earth, Fall AGU, San Francisco. [TXT] David Wiley, et al., Whale Alert: A mobile app for transmitting right whale conservation and management information to the maritime industry, Workshop on Maritime Transport and Biodiversity Conservation: Concerting Efforts for a Coherent Management of the Risk of Whale-Ship Strikes, Canary Islands (Spain) on October 25th - 26th. [PDF][PPTX] K. Schwehr, Delay Tolerant Data Collections / Bathymetry in Google Earth, DTNRG 2012 (link). [VIDEO][SLIDES] K. Schwehr, Right whale AIS Project for Whale Alert, YouTube, self published, 48 minutes. [VIDEO][VIDEO][www] K. Schwehr, Research Tools 2012: 2 guest lectures via Google Hangout, YouTube, self published. [YouTube Playlist][www] K. Schwehr, Research Tools 2011: Introduction to Linux and Scientific Data Manipulation using bash, python, emacs, YouTube, self published, 32 hours in 46 videos. [PDF] CCOM/JHC, 2011 UNH/NOAA Joint Hydrographic Center, Performance and Progress Report, University of New Hampshire, Apr 2012. [TXT] K. Schwehr, J.A. Foulkes, D. Lorenzini, M. Kanawati, Global Coastal and Marine Spatial Planning (CMSP) from Space Based AIS Ship Tracking, Fall AGU, San Francisco, Dec, 2011. [SLIDES][PDF][SRC] K. Schwehr, Vessel Tracking Using the Automatic Identification System (AIS) During Emergency Response: Lessons from the Deepwater Horizon Incident, US Hydro, Tampa, FL, 26 April 2011. [SLIDEs] K. Schwehr, 4D Non-bathy Data in Support of Hydrographic Planning, 3D/4D Visualization Techniques for Quality Control and Processing workshop, US Hydro, Tampa, FL, 26 April 2011. [PDF] CCOM/JHC, 2010 UNH/NOAA Joint Hydrographic Center, Performance and Progress Report, University of New Hampshire, Sep 2011. [SLIDES] K. Schwehr, COTF Update: Mobile devices, ERMA/GeoPlatform, AIS, SensorNetworks, Bridge and Simulator studies, CCOM VisLab Meeting, 2011. [SLIDES] K. Schwehr, Paleomagnetic and Stratigraphic Techniques for Identifying Sediment Processes on Continental Slopes, UNH ESCI Brown Bag Seminar, 2011. [SLIDES] K. Schwehr, ERMA: Environmental Response Management Application, UNH Know the Coast, 2011. [VIDEO][SLIDES][BackgroundSlides] K. Schwehr, Environmental Response Management Application (ERMA): From Portsmouth Response to NOAA's GeoPlatform Gulf Response, CCOM Seminar, Durham, NH, 24 Sept 2010. [PDF] J. Daniell, N. Ujihara, B. Mahabier, A. Herwindya, F. Freire, Y. Zarayskaya, K. Schwehr, D. Monahan and S. Sharma, A Marine GIS for the Oceania region (MARGO) ; An exploratory project, Bathymetric Science, GEBCO, Lima, Peru, 15 Sept 2010. [SLIDES][PDF Abstract] Schwehr, Armstrong, Brennan, Fischman, Sellars, Smith, Bathymtric Attributed Grids (BAGs): Discovery of Marine Datasets and Geospatial Metadata Visualization, Canadian Hydrographic Conference, June, 2010. [PDF] Alexander, L., K. Schwehr, New Standards for Providing Meteorological and Hydrographic Information via AIS Application-Specific Messages, International Hydrographic Review, No. 3, pp 37-44, 2010. [PDF] Alexander, L., K. Schwehr, R. Zetterberg, Establishing an IALA AIS Binary Message Register: Recommended Process, 17th IALA CONFERENCE, pp. 108-115, Cape Town, South Africa, 22 - 27 March 2010. [PDF] CCOM/JHC, 2009 UNH/NOAA Joint Hydrographic Center, Performance and Progress Report, University of New Hampshire, March, 2010. [SLIDES] K. Schwehr, File naming conventions: Managing many thousands of files; From NASA to NOAA Bathymetry Attributed Grids (BAGs) , Presented to NOAA OCS, 2010. [SLIDES] K. Schwehr, Chart of the Future, UNH Know the Coast, 2010. [SLIDES] K. Schwehr, Bathymetry Attributed Grids (BAGs), NOAA NGDC, Boulder, CO, 2010. [SLIDES] K. Schwehr, Chart of the Future: the next 5 years, CCOM Vislab Meeting, 2010. [SLIDES] K. Schwehr, Bathymetry Attributed Grids (BAGs) and Environmental Response Management Application (ERMA & nowCOAST), CCOM NOAA OCS Review, 2010. [TXT Abstract][VIDEO][SLIDES] Schwehr, K., Brennan, R., Sellars, J., Smith, S., Discovery of Marine Datasets and Geospatial Metadata Visualization, Fall AGU, San Francisco, CA. Dec, 2009. [PDF][VIDEO] Plumlee, M., Schwehr (presenter), K., Alexander, L., Sullivan, B., Ware C., GeoCoastPilot Better ways of organizing and displaying information in support of port familiarization , MTS/IEEE, Biloxi, MI, Oct 26-29, 2009. [PDF][SLIDES] McGillivary, P., Schwehr (presenter), K., Fall, K., Enhancing AIS to Improve Whale-Ship Collision Avoidance and Maritime Security, MTS/IEEE, Biloxi, MI, Oct 26-29, 2009. [PDF] IMO AIS Binary Message Correspondence Group, Revision of the Guidance on the Application of AIS Binary Messages, Report from the AIS Binary Messages Correspondence Group, Submitted by Sweden, Annex 1, Guidance on the use of AIS Application Specific Messages, IMO NAV 55 conference, July 2009. Un-named contributor. Wiley, David N, C. W. Clark, L. Hatch, L. Johnson, K. Koyama, R. Merrick, K. Schwehr, G. Silber, B. Tetreault, M. Thompson, Reducing the risk of ship strike to endangered whales in the Stellwagen Bank National Marine Sanctuary, International Marine Conservation Congress (IMCC), Smithsonian's Beyond the Obituaries: Success Stories in Ocean Conservation, Washington, D.C., May 20, 2009. [PDF][SLIDES] Calder, B., Schwehr, K., Traffic Analysis for the Calibration of Risk Assessment Methods, US Hydro 2009, May 11-14, Norfolk, VA.
[TXT] Michele Jacobi, Rob Braswell, Amy Merten, Nancy Kinner, Kurt Schwehr, Environmental Response Management Application (ERMA) - Web-based GIS data display and management system for oil spill planning and environmental response, Coastal Geotools, Myrtle Beach, SC, 2009 Mar 5. 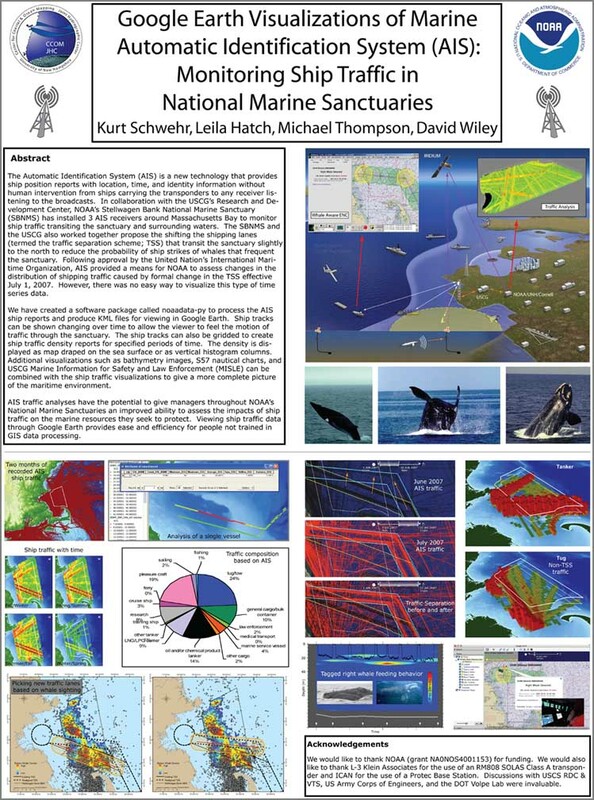 [PDF] [SLIDES] Schwehr, K., M. Plumlee, B. Sullivan, C. Ware, GeoCoastPilot: Linking the Coast Pilot with Geo-referenced Imagery & Chart Information, IHO Standardization of Nautical Publications Working Group (SNPWG), 10, Norfolk, VA, 26 Feb 2009. Invited talk. [SLIDES] Schwehr, K., L. Alexander (Presenter), Right whale AIS Project (RAP): Acoustic detections in the Boston Approaches, Inland Navigation Technology 09, Vicksburg, MS, 3 Feb 2009. Invited talk. [SLIDES] Alexander, L., K. Schwehr, Concept: IALA AIS Binary Messages Web site for message Catalog and Register, IALA AIS Working Group, Key West, FL., 15 Jan 2009. [PDF] Coastal Response Research Center, Opening the Arctic Seas: Envisioning Disasters and Framing Solutions. University of New Hampshire, Durham, NH, Jan 2009. Un-named contributor. [PDF] CCOM/JHC, 2008 UNH/NOAA Joint Hydrographic Center, Performance and Progress Report, University of New Hampshire, March, 2009. [SLIDES] B. Calder and K. Schwehr, AIS Traffic Analysis for Uncertainty Model Calibration, CCOM Seminar, 2009. [SLIDES] K. Schwehr, Right whale AIS Project (RAP): Project Update, Excelerate, Salem, MA, Jan 2009. [SLIDES] K. Schwehr, Google for the Oceans, Alton, NH, Mar 12, 2009. [SLIDES] K. Schwehr, Chart of the Future: Bridge Simulators, CCOM VisLab Meeting, April 2009. [SLIDES] K. Schwehr, Automatic Identification System (AIS), CCOM NOAA OCS Review, 2009. [SLIDES] K. Schwehr, Landing Robots on Another Planet, UNH Speakers Bureau, 2009. [SLIDES] K. Schwehr, Right whale AIS Project (RAP): Acoustic Detections in the Boston Approaches, NOAA Pacific Hydrographic Branch, Seattle, WA 2009. [SLIDES] M. Plumlee, K. Schwehr, et al., GeoCoastPilot & GeoNavTagger: Why good semantic metadata matters, CCOM NOAA OCS Review, 2009. [VIDEO][SLIDES][TXT] Kurt Schwehr, Google's Spatial Tools in the Marine Environment - Decision Support, Google Tech Talk, San Francisco, CA, Dec 16th, 2008. 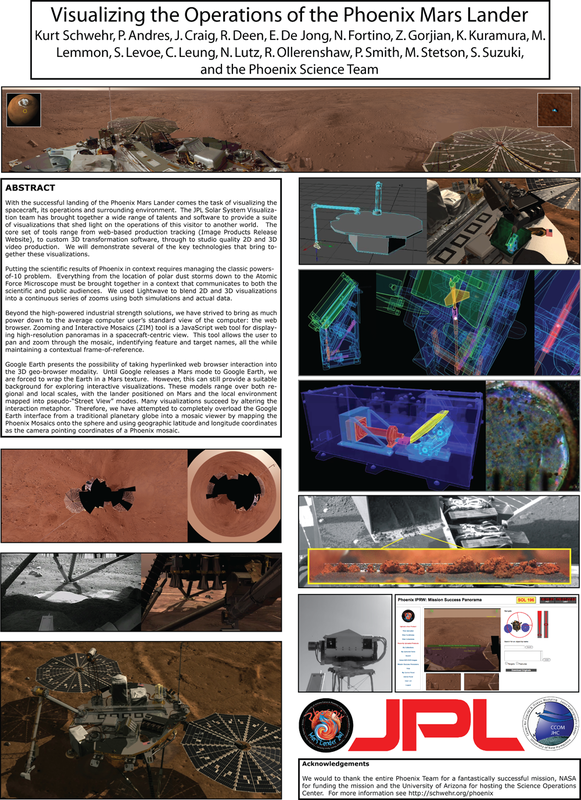 [DOC][TXT][PNG] Schwehr, Andres, Craig, Deen, De Jong, Fortino, Gorjian, Kuramura, Lemmon, Levoe, Leung, Lutz, Ollerenshaw, Smith, Stetson, Suzuki, and the Phoenix Science Team, Visualizing the Operations of the Phoenix Mars Lander, Fall AGU, San Francisco, CA, Dec 18, 2008. [SLIDES][DOC][TXT] Plumlee, Schwehr, Sullivan, Ware, GeoCoastPilot - Linking the Coast Pilot with Geo-referenced Imagery & Chart Information, Shallow Survey 2008, Portsmouth, NH, Oct 21-24, 2008. [PDF] Schwehr, K., seismic-py: Reading seismic data with Python., The Python Papers, 3:2, 8 pages, Sep 4, 2008. [PDF] Hatch, L., C. Clark, R. Merrick, S. Van Parijs, D. Ponirakis, K. Schwehr, M. Thompson, D. Wiley, Characterizing the Relative Contributions of Large Vessels to Total Ocean Noise Fields: A Case Study Using the Gerry E. Studds Stellwagen Bank National Marine Sanctuary, Environmental Management, 42(5), 735-52, Nov 2008. [PNG][TXT] Monahan, D. Schwehr, K., Wigley, R., Tinmouth, N., Goncalves, D., Jinidasa, P., Uddin, J., Ito, K., Gebco Visual Library, Proof of Concept, GEBCO Annual Meeting, Tokyo, Japan, May 2008. [PDF Presention][PDF Paper] Michele Jacobi, Nancy E. Kinner, Bobby H. Braswell, Kurt D. Schwehr, Kimberly S. Newman, Amy A. Merten, Environmental Response Management Application, International Oil Spill Conference, Savannah, Georgia, May 4-8, 2008. [TXT] Braswell, B., K. Schwehr, T. Milliman, J. Fisk, Open Geoscience: Using Free and Open Source Software for Research and Education, AAG Meeting, Boston, MA, April 18, 2008. [PDF] CCOM/JHC, 2007 UNH/NOAA Joint Hydrographic Center, Performance and Progress Report, University of New Hampshire, March, 2008. [SLIDES] K. Schwehr, Phoenix Mars Lander; Visualization of the Surface of Another Planet, CCOM Seminar Series, 2008. [SLIDES] K. Schwehr, Right whale AIS Project (RAP); Acoustic Detections in the Boston Approaches, RTCM SC121, Nov, 2008. [SLIDES] K. Schwehr, Right Whale AIS Zone Update, RTCM SC121, May, 2008. [SLIDES] K. Schwehr, Invited lecture in Geology of Coasts, UDel GEOL434/634, 2008. [SLIDES] K. Schwehr, Scripting Languages in Science, UNH CCOM Student Seminars, 2008. [SLIDES] K. Schwehr, Spatial Tools In the Marine Environment: Decision Support, NASA Ames Intelligent Systems Seminar, 2008. [SLIDES] K. Schwehr, Whales and Wikis or Wiki Wiki Whales, CCOM Seminar, April 2008. [SLIDES] D. Wiley, J. Box, L. Hatch, K. Schwehr, Using Auto-Buoys to Detect Whale Calls in the Boston TSS, Boston Port Operators Group (POG), 2008. [SLIDES] Digital GeoCoastPilot: Thinking Ahead, NOAA Office of Coast Survey (OCS) Coast Pilot group, 2008. [SLIDES] Chart of the Future Update: Mar 2008, NOAA OCS Visit to CCOM, 2008. [SLIDES] Solar System Visualization at NASA/JPL, CCOM Vislab Meeting, 2008. [SLIDES] Mockup of an AIS Binary Message Creation Tool - WebUI, 2008. [PDF] Schwehr, K., Alexander, L., Encoding AIS Binary Messages in XML Format for Providing Hydrographic-related Information, International Hydrographic Review, 8:2, pp 37-57, 2007. [DOC abstract][JPG] Kurt Schwehr, Leila Hatch, Michael Thompson, David Wiley, Google Earth Visualizations of the Marine Automatic Identification System (AIS): Monitoring Ship Traffic in National Marine Sanctuaries, Fall AGU, San Francisco, CA, 10-14 Dec 2007. [SLIDES][PDF] Kurt Schwehr, AIS Binary Messages, Domain Examples and A case for a XML message definition language, RTCM SC121 Working Group on Expanded Use of AIS with VTS, November 15, 2007, USCG Puget Sound VTS, Seattle, WA, RTCM Paper 220-2007-SC121-013. [PDF] Schwehr, K.D., McGillivary, P.A., Marine Ship Automatic Identification System (AIS) for Enhanced Coastal Security Capabilities: An Oil Spill Tracking Application, Oceans07 MTS/IEEE, Vancouver, B.C. 29 Sept - 4 Oct 2007. [PDF] Schwehr, K., N. Driscoll, L. Tauxe, Origin of continental margin morphology: submarine-slide or downslope current-controlled bedforms, a rock magnetic approach, Marine Geology, 240:1-4, pp 19-41, 2007, doi:10.1016/j.margeo.2007.01.012. 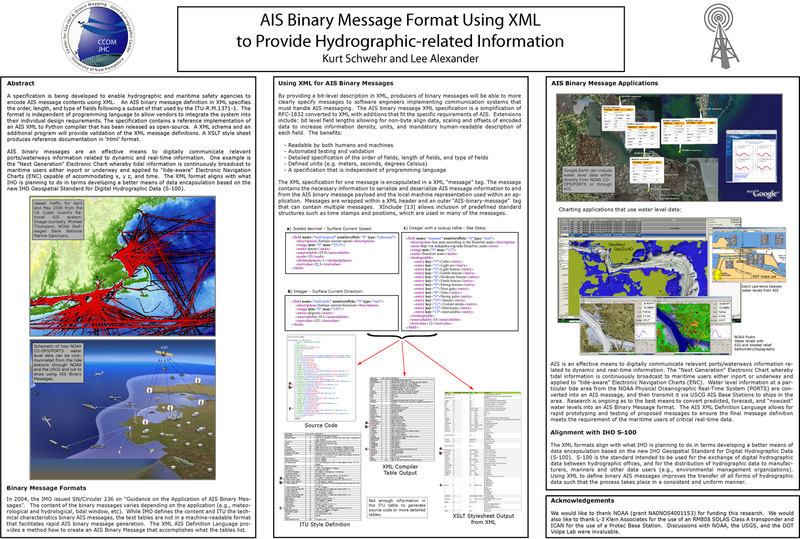 [PDF Paper][PNG Poster] Schwehr, K., Alexander, L. (2007), Specification Format for AIS Binary Messages for Providing Hydrographic-related Information, US Hydro 2007, 14-17 May, 21 pages. [SLIDES][DOC Abstract] Schwehr, K., Sullivan, B., Gardner, J. V. (2007), Google Earth Visualizations: Preview and Delivery of Hydrographic and Other Marine Datasets, US Hydro 2007, 14-17 May, abstract and talk only. [SLIDES][DOC Abstract] Brennan, R, Gallagher, B, Riley, J, Schwehr, K Alexander, L (2007), Tide Aware ENC: Demonstration of an Operational Concept, US Hydro 2007, 14-17 May, abstract and talk only. 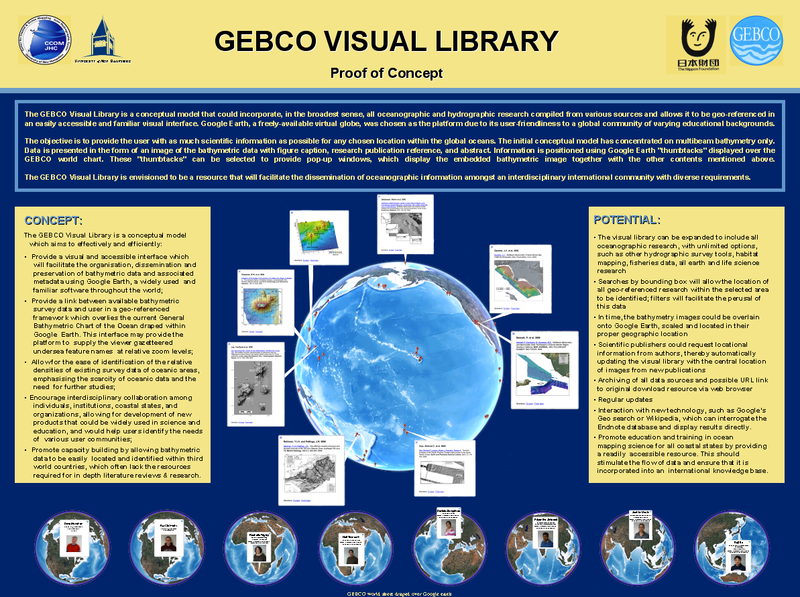 [PDF] Schwehr, K., Google Earth Visualizations: Preview and Delivery of Hydrographic and Other Marine Datasets, 13-Apr-2007, unpublished report. [PDF] CCOM/JHC, 2006 UNH/NOAA Joint Hydrographic Center, Performance and Progress Report, University of New Hampshire, March, 2007. [SLIDES] K. Schwehr, Exploration Visualization, UNH Computer Science Seminar, Feb, 2007. [SLIDES] Portsmouth Harbor Response Initiative: Discussion and Demonstration, 2007. [SLIDES] K. Schwehr, Chart of the Future, NOAA Office of Coast Survey CCOM Review, 2007. [SLIDES] K. Schwehr, Introduction to Python - Part 2, CCOM VisLab Seminar, 2007. [SLIDES] K. Schwehr, AIS Binary Messages, USCG RDC AIS Meeting, 2007. [SLIDES] K. Schwehr, North East Gateway Whale Detection System at the Stellwagen Bank National Marine Sanctuary, NOAA SBNMS Office, 2007. [PDF][KML] Schwehr, K., L. Tauxe, N. Driscoll, and H. Lee (2006), Detecting compaction disequilibrium with anisotropy of magnetic susceptibility, Geochem. Geophys. Geosyst. (G-Cubed), 7, Q11002, doi:10.1029/2006GC001378. [PDF] Curcio, J., P. A. McGillivary, K. Fall, A. Maffei, K. Schwehr, B. Twiggs, C. Kitts, P. Ballou, Self-Positioning Smart Buoys, The 'Un-Buoy' Solution: Logistic Considerations using Autonomous Surface Craft Technology and Improved Communications Infrastructure, IEEE MTS, Boston, MA, 2006. [PPT][SLIDES] McGillivary, P. A., Curcio, J., Fall, K., Maffei, A., Schwehr, K., Kitts, C., Twiggs, B., Autonomous Surface Vessels for Air-Sea Flux and Satellite Calibration / Validation Studies, 1st Joint GOSUD/SAMOS Workshop, Boulder, CO., May 2006. [PDF][SLIDES] Schwehr, K. Paleomagnetic and Statigraphic Techniques for Identifying Sediment Processes on Continental Margins, PhD Thesis, Scripps Institution of Oceanography, UCSD, La Jolla, CA, May, 2006, 131 pages. [SLIDES] 20000 Bits Under the Sea: How Robotics, Visualization, and Scientific Computing are Changing the Way We Explore, Discover, and Understand Our Oceans , SigGraph, 2006. [SLIDES] Chart of the Future: Understanding Ship Traffic, NOAA Office of Coast Survey CCOM Review, 2006. [SLIDES] Chart Of the Future, CCOM Review, Dec 2006. [SLIDES] Marine Automatic Identification System, USCG Portsmouth NH, 2006. [SLIDES] Slumps and Slides, R/V Revelle student cruise, 2006. 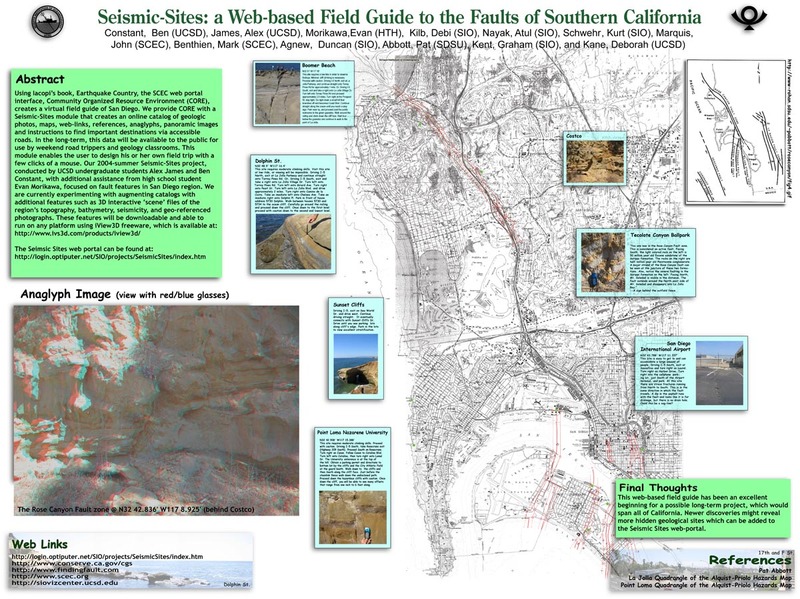 [SLIDES] Visualization: A geologist's perspective, Colin Ware's Visualization Class, 2006. [SLIDES] Chart of the Future, CCOM Seminar, 2006. [SLIDES] Bathymetryic Genericalizer and the Chart of the Future, CCOM Vislab, 2006. [SLIDES] A Python Tutorial, CCOM Vislab Meeting, 2006. [PDF][SLIDES] Schwehr, Derbes, Edwards, Nguyen, Zbinden, Designing visualization software for ships and robotic vehicles, IS&T/SPIE Paper Number 5669-23, San Jose, CA., 18-Jan-2005. [PDF][SLIDES] Schwehr, Johnson, Kilb, Nayak, Nishimura, Visualization tools facilitate geological investigations of Mars exploration rover landing sites, IS&T/SPIE Paper Number 5669-15, San Jose, CA., 17-Jan-2005. 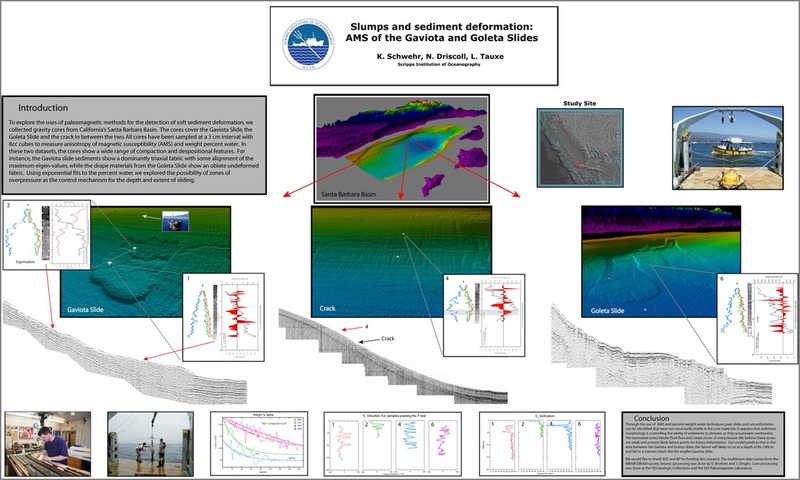 [TXT][JPG] Schwehr, K., N. Driscoll, Tauxe, L. (2005), Slumps and sediment deformation: AMS of the Gaviota and Goleta Slides, AGU Fall Meeting Abstracts, Poster. [SLIDES] K. Schwehr, From Mars to the Oceans Software for Exploration, UNH CCOM Seminar, 2005. 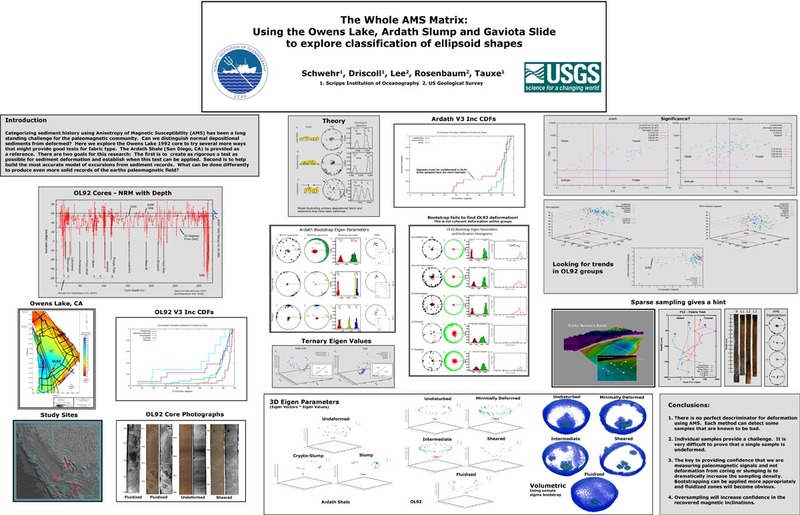 [PDF][JPG] Kurt Schwehr, Neal Driscoll, Lisa Tauxe, Homa Lee, Joseph Rosenbaum, The Whole AMS Matrix: Using the Owens Lake and Gaviota Slide cores to explore classification of ellipsoid shapes, Fall AGU, San Francisco, CA. Dec 2004, Poster. [TXT][JPG] Ben Constant, Alex James, Evan Morikawa, Debi Kilb, Atul Nayak, Kurt Schwehr, John Marquis, Mark Benthien, Duncan Agnew, Pat Abbot, Graham Kent, Deborah Kane, Seismic-Sites: a Web-based Field Guide to the Faults of Southern California, Southern California Earthquake Center Annual Meeting, http://www.scec.org/meetings/2004am, Palm Springs, CA, 2004, Poster. [WEB] K. Schwehr, Visualizations of magnetic anisotropy: How to stop worrying and love the blob, SIO Visualization Contest, La Jolla, CA, Fall 2004. [SLIDES] K. Schwehr, Working on a Mars Mission, Gompers High School, 2004. [SLIDES] K. Schwehr, Lead 210 In Sediment Cores, Driscoll Lab Meeting, 2004. [PDF] Schwehr, K. and Tauxe, L., Characterization of soft sediment deformation: Detection of crypto-slumps using magnetic methods, Geology, v. 31, no. 3, p. 203-206, 2003, doi:10.1130/0091-7613(2003)031<0203:COSSDD>2.0.CO;2. [TXT][JPG] Kurt Schwehr, Neal Driscoll, Homa Lee, Lisa Tauxe, Exploration of the Humboldt Slide using Anisotropy of Magnetic Susceptibility Comparison with the Gaviota Slide, AGU, San Francisco, CA. Abstract #8437, Dec 2003, Poster. 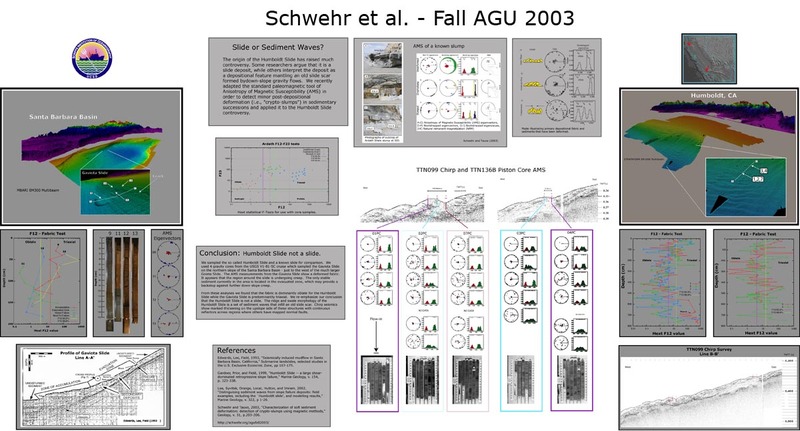 Kurt Schwehr, Neal Driscoll, Lisa Tauxe, Continued Exploration of the Humboldt Slide using Anisotropy of Magnetic Sysceptibility, Schwehr, Driscoll, Tauxe, Oceans 2003, San Diego, Abstract #999, Sept 2003, Poster. [TXT][JPG] KurtSchwehr, Neal Driscoll, Lisa Tauxe, Deciphering the origin of the Humboldt Slide using Anisotropy of Magnetic Susceptibility, Schwehr, Driscoll, Tauxe, EGS-AGU-EUG Joint Assembly, Nice, France, EAE03-A-12756, April 2003, Poster. [WEB] Kurt Schwehr, SIO Visualization Class, Lectures 1-10, SIO Visualization Center/CalIT2, SIO, 2003. [SLIDES] K. Schwehr, Exploring the Surface of Mars: Autonomy and Mobility for Planetary Geology, CalSpace Seminar, 2003. 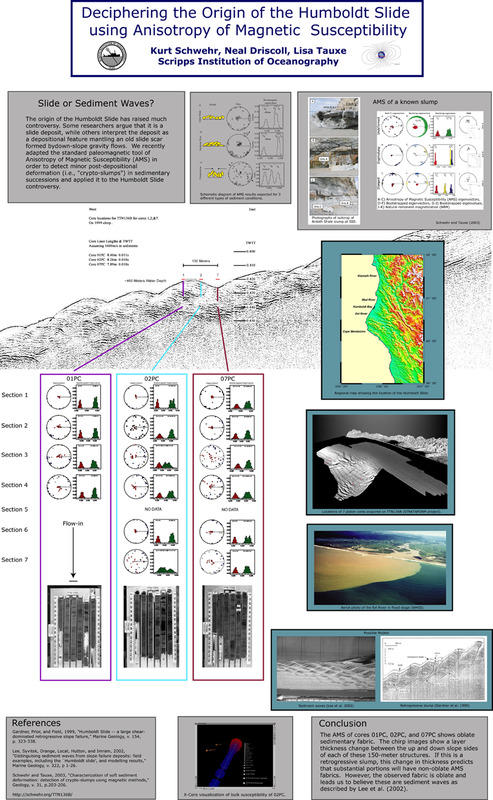 [SLIDES] K. Schwehr, Deciphering the Humboldt Slide Using Magnetics and 3D Core Visualization, MBARI, 2003. [SLIDES] K. Schwehr, Scripps Explorers, San Diego County Fair, 2003. [SLIDES][SLIDES 2] K. Schwehr, Torrey Pines State Reserve, USCD SIO Teacher Training, 2003. [SLIDES] K. Schwehr, Deciphering the Humboldt Slide Using Magnetics and 3D Core Visualization, USGS Menlo Park, 2003. [PDF] Nguyen LA, Bualat M, Edwards LJ, Flueckiger L, Neveu C, Schwehr K, Wagner MD, Zbinden E, Virtual reality interfaces for visualization and control of remote vehicles, Autonomous Robots 11(1):59-68, 2001. [PDF] Cabrol, N.A., G. Chong-diaz, C.R. Stoker, V.C. Gulick, R. Landheim, P. Lee, T.L. Roush, A.P. Zent, C. Herrera Lameli, A. Jensen iglesia, M. Pereeira Arrerondo, J. M. Dohm, r. keaton, D. Wettergreen, M. H. Sims, K. Schwher, M. G. Bualat, H.J. Thomas, E. Zbinden, D. Christian, L. Pedersen, A. Bettis III, G. Thomas, and B. Witzke, Nomad Rover Field Experiment, Atacama Desert, Chile: 1. Science results overview, Journal of Geophysical Research, V. 106, No. E4, Pages 7785-7808, April 25, 2001. [PDF] Laurent A. Nguyen, Maria Bualat, Laurence J. Edwards, Lorenzo Fluekiger, Charles Neveu, Kurt Schwehr, Michael D. Wagner, Eric Zbinden, Virtual Reality Interfaces for Visualization and Control of Remote Vehicles, ICRA 2000. [PDF] Sanjiv Singh, Kurt Schwehr, Reid Simmons, Trey Smith, Anthony Stentz, Vandi Verma, and Alex Yahja Recent Progress in Local and Global Traversability for Planetary Rovers, ICRA, 2000. [PDF] Eric Zbinden, Laurent Nguyen, Kurt Schwehr, Viz: An Automated 3D Mapping System for Planetary Exploration, ISPRS II/I, Amsterdam, Summer 2000. [PDF] Schwehr, Kurt, Martian Igneous Processes based on Mars Pathfinder Lander and Sojourner Rover, Paper for SIO Igneous Petrology class, 2000. [PDF] Stoker, C.R., E. Zbinden, T. T. Blackmon, B. Kanefsky, J. Hagen, P. Henning, C. Neveu, D. Rasmussen, K. Schwehr and M. Sims, Analyzing Pathfinder Data using Virtual Reality and Super-resolved Imaging, J. Geophys. Res., Planets, V104(E4), pp 8889-8906, Apr. 1999. [TXT] Schwehr, Kurt, Stereo Processing for the Mars Polar Lander, MVACS Image Pipeline / James Pipeline, Unpublished report, 1999. [TXT] Nguyen, L., Kurt Schwehr, Deanne Tucker, Eric Zbinden, Alex Derbes, Paul Henning, Nick Vallidis, The Viz Architecture, Unpublished tech report March 1999. [PDF][LINK] P. Lee, W. A. Cassidy, D. Apostolopoulos, M. Deans, A. Foessel, C. Krause, J, Parra, L. Pedersen, K. Schwehr, R.P. Harvey, and W.L. Whittaker, Search for Meteorites in the Patriot Hills Area, Ellsworth Mountains, West Antarctica, Meteoritics & Planetary Science, Vol. 33, No 4,S, pp A92-3, July 1998. [PDF] Nathalie A. Cabrol, G. Chong Diaz, et al., Atacama I: Science Results of the 1997 Nomad Rover Field Test in the Atacama Desert, Chile, Lunar and Planetary Science Conference XXIX, Houston, TX, 1998. [PDF] Nathalie A. Cabrol, G. Chong Diaz, George Dunfield, et al., Atacama II: Nomad Rover Sample 1-250697 and Implications for Fossil Characterization During Mars Exploration, Lunar and Planetary Science Conference XXIX, Houston, TX, 1998. [PDF] N. Cabrol, P. Lee, G. Chong Diaz, et al., Atacama III: Meteorite Search During the Nomad Field Tests: Perspectives on Automated Field Operations by Teleoperated Vehicles in Extreme Environments, Lunar and Planetary Science Conference XXIX, Houston, TX, 1998. [PDF] C. Stoker, T. Blackmon, J. Hagen, B. Kanefsky, D. Rasmussen, K. Schwehr, M. Sims, E. Zbinden, Marsmap: An Interactive Virtual Reality Model of the Pathfinder Landing Site, Lunar and Planetary Science Conference, Houston, TX. 1998. [PDF] Zbinden, Stoker, Blackmon, Schwehr, Henning, Neveu, Kanefsky, Mapping Mars Using Virtual Reality: The Pathfinder Experience, ISPRS WG IV/5, Extraterrestrial Mapping Workshop on Mapping of Mars, April 1998, London, UK. [TXT] Schwehr and Nguyen, Viz Technical Notes:Design and Implementation of the Viz Architecture, Unpublished, 1998. [PDF] David Wettergreen, Maria Bualat, Daniel Christian, Kurt Schwehr, Hans Thomas, Deanne Tucker, Eric Zbinden, Operating Nomad during the Atacama Desert Trek, Proc. Field and Service Robotics Conference, Canberra, Australia, December 1997. [PDF] Daniel Christian, David Wettergreen, Maria Bualat, Kurt Schwehr, Deanne Tucker, Eric Zbinden, Field Experiments with the Ames Marsokhod Rover, Proceedings of the 1997 Field and Service Robotics Conference, Canberra, Australia, December 1997. [TXT] C. Stoker, T. Blackmon, J. Hagen, P. Henning, B. Kanefsky, C. Neveu, D.Rasmussen, K. Schwehr, M. Sims, E. Zbinden, MarsMap: Analyzing Pathfinder Data using Virtual Reality, AGU, December 1997, Talk. [PDF][DOC] C. R. Stoker, D. Barch, J. Farmer, M. Flagg, T. Healy, T. Tengdin, H. Thomas, K. Schwer and D. Stakes, Exploration Of Mono Lake With An ROV: a prototype experiment for the MAPS AUV program, IEEE Symposium on Autonomous Underwater Vehicle Technology, June 3-6, Monterrey, CA, 1996. [PDF][HTML] Kurt Schwehr and Daniel Delgado, GRASS Usage for Virtual Planetary Exploration, Manual for the VPE Lab at Nasa Ames Research Center, 1994. [HTML] Elizabeth L. Miller, Phillip B. Gans, and the Stanford Geological Survey, Geologic Map of Wheeler Peak and Minerva Canyon 7.5' Quadrangles, White Pine County, Nevada, unpublished , somewhere in the USGS CR, 1993. Draft available via web. Members of the Stanford Geological Survey in 1993 included Jeffrey M. Amato, Kai S. Anderson, Jack W. Daniels, Pilar E. Garcia, Andrew D. Hansen, Brian Landau, Ezra M. Mauer, Natalie A. McCullough, Kurt D. Schwehr and Benjamin E. Surpless. [HTML] Schwehr and SIMM93, Mars Surface Science, Precursor Rover Mission Options, Exploration Vehicle Science Equipment, and Autonomous Rovers and Virtual Environments, Stanford Internation Mars Mission with Professor Bruce Lusignan, 1993. [HTML] Kurt Schwehr, ROV Telepresence Software, NASA Ames Contractor Report, 1992. [TXT] Linda Garcia and Kurt Schwehr, Conversion of Sugar Cane to Ethanol for the Philippines, Report to the Sierra Club Palo Alto Chapter, Palo Alto, CA, 1991. [HTML] Kurt Schwehr, Martian Dust Issues: Triboluminescence and Composition, NASA Ames Contractor Report, 1990.